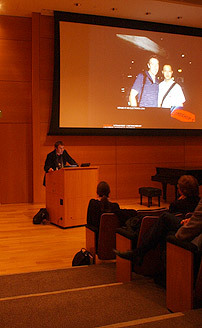 I was invited by Terry Thornton to give a lecture at the Fort Worth Modern Art Museum on Feb. 21st, 2006, at 7pm, as part of the Tuesdays at the Modern Lecture Series. 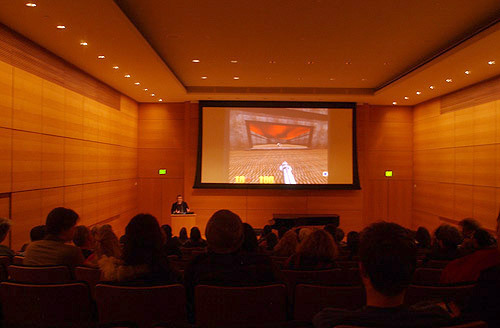 The title of the presentation was “Feng Mengbo, Bytes and Pieces, and Electronic Media Art.” There were at least 150 attendees. I would like to thank all who came out to support the event. I would also like to thank Assistant Professor of Sculpture at UNT School of Visual Arts, Andy Holtin for co-curating the “Bytes and Pieces” exhibition with me. As per the request of artist and gallery owner Paul Slocum (founder of “And/Or” Art Gallery) who attended the lecture, I will post links to some of the artists websites and video documentation I referenced last night. Enjoy. Also, you may contact me at maxk@unt.edu with questions, comments, blogs, shows, etc. You may also visit me my office at The University of North Texas – School of Visual Arts #315 Tuesdays and Thursdays. The lecture and the subject was interesting and you gave a very broad introduction to some innovative work. I was particularly struck by Feng Mengbo’s appropriation (if you will)of what may be considered one of the frontiers of the symiotic nature of our association and obsession with virtual reality.The ability to visually interact with virtual selves and evoke virtual scenarios is nothing short of monumental, yet these devices and concepts are now so engrained in our “virtual conciousness” that we rarely contemplate the ramifications and implications of this connection to machines. I applaud your work in the field and your exploration with other artists that do similar work. I hope to speak with you more about this work and find ways of integrating some of these concepts into my own work, which is now only in the infancy of delving into electronic, digital and binary expression.